This ministry exists to help build up the women of the church -- spiritually and relationally. Using a Gospel-centered approach, we meet weekly around Scripture and biblical themes to dig deeper into our faith. 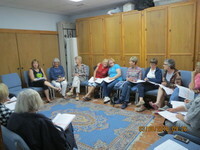 Using video teaching by recognized Christian teachers, we discuss together and study individually throughout the week. Our goal is to allow the Word of God to transform us--in our own lives and in our relationships. We meet Thursday mornings at 9:00 at the church-- October through May. Often smaller groups of women will gather together in homes for continuing study during the summer months.